Even after the experience of WWII and despite the existence of various institutions such as United Nations to avoid conflict between nations, we have not succeeded in making a world free from war. The Cold War, the Vietnam War, the intervention of the superpowers in local conflicts and the spread of terrorism have made this all too clear. 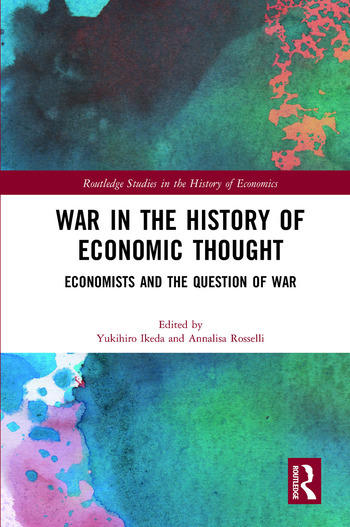 This volume brings together contributions by leading international scholars of various countries and reconstructs how economists have dealt with issues that have been puzzling them for nearly three centuries: Can a war be 'rational'? Does international commerce complement or substitute war? Who are the real winners and losers of wars? How are military expenses to be funded? The book offers a refreshing approach to the subject and how we think about the relations between economics and war. Yukihiro Ikeda is Professor of History of Economic Thought at Keio University, Japan. Annalisa Rosselli is Professor of History of Economic Thought at the University of Rome Tor Vergata, Italy. 'While Marxists assert ubiquity of economic interest behind war motives, Albert O. Hirschman praised the cooling effect of commercial interest over the warlike passion. In any case, war and peace is one of the most significant themes that has motivated generations of economists for their investigation. What is the economic cause of the war, how to pay the war, what is the condition for the peace? Focusing such topics, historians of economic thought of the West and Japan gathered to offer their investigations into the ideas and deeds of economists that not only contributed the tradition of this discipline but also influenced general political orientations then.